Water quality in the Maryland/Virginia Coastal Bays has been declining for many years from anthropogenic inputs, but conditions appear to have worsened abruptly following a shift from long-term dry to long-term wet conditions in the early 2000s. Annually and regionally averaged total nitrogen concentrations are approximately twofold higher, but ammonium (NH4 +) concentrations are up to an order of magnitude higher than in the early 1990s. Averaged nitrate concentrations, however, changed to a lesser degree throughout the time course; water column concentrations remain very low. Total phosphorus has only increased in some bay segments, but increases in phosphate (PO4 3−) have been more pervasive. There were differences in the year in which large increases in each nutrient were first noted: PO4 3− in ~2001–2002, followed by NH4 + ~a year later. The effects of a combination of steadily increasing anthropogenic nutrient increases from development, superimposed on nutrient loads from farming and animal operations, and groundwater inputs were accelerated by changes in freshwater flow and associated, negatively reinforcing, biogeochemical responses. Regionally, chlorophyll a concentrations have increased, and submersed aquatic vegetation has decreased. The system is now characterized by sustained summer picoplanktonic algal blooms, both brown tide and cyanobacteria. The retentive nature of this coastal lagoon combined with the reducing nature of the system will make these changes difficult to reverse if the current dual nutrient management practices are not accelerated. The coastal embayments of Maryland and Virginia, shallow coastal lagoons, have been experiencing the impacts of eutrophication over the past decade, as evidenced by increasing nutrients, sporadic or sustained hypoxia, increased macroalgal and phytoplankton blooms, losses of submersed aquatic vegetation (SAV), among other effects (Goshorn et al. 2004; Wazniak et al. 2007; Glibert et al. 2007, 2010; Fertig et al. 2013). In addition, the phytoplankton blooms have been shown to be composed of increasing proportions of those species that are considered to be harmful algal blooms (HAB) species, including the brown tide species Aureococcus anophagefferens (Trice et al. 2004; Wazniak and Glibert 2004; Glibert et al. 2007). These trends, however, are also temporally and spatially variable, but the causes of such variability are not well understood. As is the case with many coastal regions, the human population of the coastal bays watershed has increased substantially over the past several decades and has approximately doubled since 1980 and is expected to double again in the coming decades (Wazniak et al. 2007). Moreover, summer populations of tourists add additional human pressure to the region. Nutrient loading from development and other anthropogenic changes has increased accordingly. The regional watershed has traditionally been dominated by farming and forestry. In addition to housing development, current land use is now a mix of intensive poultry operations, agriculture, forests, extensively ditched wetland systems, and a national park barrier island system (Boynton et al. 1996; Wazniak et al. 2007; Glibert et al. 2007). Thus, tools to assess the status and rate of change of the system are needed to guide management decisions, while rapidly changing conditions provide daunting challenges for ecosystem managers. 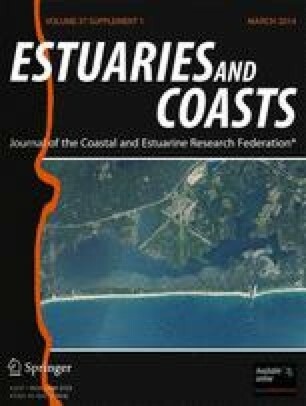 Coastal lagoons are fundamentally different types of estuaries than more classical river-dominated systems (Kurtz et al. 2006; Madden 2010; Glibert et al. 2010). Coastal lagoons are shallow, demonstrate strong benthic–pelagic coupling, and have minimal freshwater input as well as limited oceanic exchange. Specifically in the case of the Maryland/Virginia Coastal Bays, average depths range from 0.67 to 1.22 m (Boynton et al. 1996) depending on the bay region and have flushing rates on the order of ~7 % day−1 (Pritchard 1969). Thus, nutrients and contaminants that enter the bay tend to stay in the bay. Furthermore, differences in the quality of the nutrient pool, the seasonal timing of delivery and the source of nutrients, as well as in the resident phytoplankton community lead to different types of algal blooms in coastal lagoons than in river-dominated estuaries (Glibert et al. 2010). Algal blooms in coastal lagoons are often comprised of picoplanktonic species, are generally sustained on regenerated or chemically reduced forms of nitrogen (N), such as ammonium (NH4 +), urea or dissolved organic nitrogen (DON), and may be sustained for long periods of time (e.g., Berg et al. 1997; LaRoche et al. 1997; Gobler et al. 2005; Lomas et al. 2001, 2004). Sustained blooms of picoplankton such as those of A. anophagefferens are not only HABs, but have been given a unique term, “ecosystem disruptive algal blooms” (EDABs; Sunda et al. 2006). A monitoring program has been in place in the Maryland/Virginia Coastal Bays since the early 1990s allowing many water quality parameters to be tracked. Additionally, a Comprehensive Conservation Management Plan has been in place for nearly two decades, with goals of decreasing nutrients, increasing seagrass distributions, and maintaining viable fisheries populations (Maryland Coastal Bays Program MCBP 1999). In fact, the early years of this record (pre mid-1990s) suggested improving water quality conditions in terms of nutrient levels, with 17 % of sites showing improvement in total nitrogen (TN), 50 % in total phosphorus (TP), and 33% in chlorophyll a (Chl a) when analyzed using linear trends (Wazniak et al. 2007), suggesting that management actions were effective. However, since the late 1990s, TN, TP, and Chl a have increased (Wazniak et al. 2007), and increases in frequency and intensity of blooms of A. anophagefferens have also been noted (Trice et al. 2004; Glibert et al. 2007). Here, we extend these previously documented trends in water quality parameters, with emphasis on large-scale, regional change, and we show that not only has water quality worsened, but that many of these changes occurred over a period of a few critical years during the early 2000s. We explore the reinforcing anthropogenic, natural, biological, and biogeochemical feedbacks that contribute to sustained degradation of these water bodies. We recognize that such a large-scale approach will not fully detail the changes at local scales, some of which are, in fact, more significant than portrayed by the regional average analysis (c.f., Beckert et al. 2011; Fertig et al. 2013). A central question is: to what extent are anthropogenic changes in nutrients the cause of the decline of water quality now documented? If so, which nutrients have shown the greatest change and why do there appear to be periods of abrupt rather than gradual change? The analysis herein is based on data collected by the National Park Service that has conducted a monthly water quality sampling program at 18 stations throughout the Coastal Bays sub-embayments, Newport, Sinepuxent, and Chincoteague Bays, since the late 1980s (Fig. 1). The frequency of sample collection has been monthly since 1994, and thus, the bulk of the data herein are inclusive of 1994–2008 or 2009, depending on the parameter. The 18 stations were grouped into seven bay segments, based on geographic proximity, previously documented similarity in water quality trends, and on the basis of regions for which current or future management applications may be regionally relevant (Fig. 1). The same protocols, analysis methods, and instrumentation have been used throughout all sampling years for all nutrient analyses. Whole water samples were collected and either filtered on board or stored in the dark on ice until transferred to the laboratory (within ~4 h), where aliquots were filtered through Whatman GF/F filters (nominally 0.7 μm) for inorganic nutrient and pigment analysis. The filtrate of precombusted filters was stored frozen for subsequent nutrient analysis; the filters were stored at −80 °C. Inorganic nutrients (NO3 − + NO2 −, hereafter referred to only as nitrate, NO3 − as concentrations of NO2 − were very low; NH4 +; phosphate, PO4 3−; and silicate, Si(OH)4), were analyzed in the laboratories of the University of Maryland Center for Environmental Science using standard auto-analysis methods (Lane et al. 2000; Keefe et al. 2004). In addition, TN and TP were analyzed on samples that were not filtered using persulfate combustion techniques (Valderrama 1981; Bronk et al. 2000; Solórzano and Sharp 1980). Analyses of phytoplankton Chl a and accessory pigments were by high performance liquid chromatography (HPLC; Van Heukelem and Thomas 2001). The HPLC methods evolved during the decades of monitoring as previously described by Trice et al. (2004). Although Chl a data are available for the entire time course under consideration, comparative accessory pigment data are only available from 1999 onwards. Herein, we have used several common photosynthetic pigments as chemotaxonomic markers to identify changes in phytoplankton community composition (e.g., Andersen et al. 1996; Suzuki et al. 1997; Ansotegui et al. 2001). In particular, we investigated the changes in the xanthophyll 19′-butanoyloxyfucoxanthin (hereafter but-fuco) as a marker for pelagophytes such as A. anophagefferens (brown tide), peridinin as a marker for peridinin-containing dinoflagellates, fucoxanthin as a marker for diatoms (although recognizing that this pigment may also be present in chrysophyte and prymnesiophytes), and zeaxanthin as a marker for cyanobacteria (Kana et al. 1988; Jeffrey and Vesk 1997). Trends in SAV were based on the Virginia Institute of Marine Sciences annual surveys (http://web.vims.edu/bio/sav/). Methods for SAV estimation were as described in Wazniak et al. (2007) and represent single, annual estimates by bay region. Data for freshwater flow were derived from the United States Geological Survey (USGS) surface water discharge estimates from a nearby, gauged stream, the Nassawango Creek near Snow Hill, MD, USA. Monthly discharge data were downloaded from the USGS web site (http://waterdata.usgs.gov/nwis/monthly, accessed April 10, 2009 and July 3, 2012). This stream does not discharge into the Coastal Bays, but it is directly adjacent to the bays and thus served as a proxy measurement of potential groundwater flows into the bays. This stream was chosen because it is the nearest site for which continual monitoring has occurred over the same time period as water quality monitoring of the Coastal Bays. This stream and the Coastal Bays are similarly influenced by regional climatic variability. Long-term trends were analyzed using several approaches. First, frequency distributions of the concentrations of the inorganic forms of nutrients were determined using all available data in the database (>3,000 data points per analyte). Second, seasonal averages were calculated to determine overall seasonal patterns. Third, annual averages were calculated by bay segments and overall trends were examined with time and linear trends were determined. Note that polynomial trend analysis was applied to an earlier portion of this time series by Wazniak et al. (2007). In addition, cumulative sums of variability (CUSUM; e.g., Page 1954; MacNally and Hart 1997; Manly and Mackenzie 2003; Mesnil and Petitgas 2009) values were calculated for selected parameters and compared. CUSUM analysis was conducted only on those parameters for which the time series extended >10 years; accessory pigment data were not included in this analysis. As background, CUSUM-transformed relationships compare accumulated differences between each measurement and their average benchmark value over time. CUSUM is, in effect, a low-pass filter for time series analysis. It provides a relatively simple and visually accentuated means to assess the degree to which values deviate from the norm over time. Herein, the z-score CUSUM approach of Briceño and Boyer (2010) was applied. Z-scores for all data series were calculated as each individual datum value minus the overall average of the data in the time series, divided by the overall standard deviation. To calculate CUSUM, the z-scores are summed through time. Downward trends are indicative of values consistently below the long-term mean, upward trends indicative of values above the long-term mean; they should not be interpreted as downward or upward “slopes.” It is the change in CUSUM over time, the break points in the time series, or the comparison of CUSUM changes in one parameter relative to another, that is of interest. Absolute CUSUM values are not important to the understanding of relationships. Absolute CUSUM values will change depending on the length of the time series, as inclusion of additional data will change the “population” mean and standard deviation. CUSUM charts are particularly useful in identifying the distinct inflection points which signify a point in time when there was a shift in the relationship of the data relative to the mean. All CUSUM analyses were calculated using all available monthly data, not annual averages. Concentrations of NO3 − remained very low throughout the time series, with ~80 % of all values having concentrations <1 μM-N (Fig. 2a). In contrast, for NH4 +, ~35 % of all samples had values <1 μM-N, >40 % of samples had values >2 μM-N, and ~10 % of all samples had values >10 μM-N (Fig. 2b). For PO4 3−, >60 % of all samples had concentration values <0.50 μM-P (Fig. 2c). Seasonally, mean concentrations of NH4 + remained >2 μM-N throughout the year, while mean concentrations of NO3 − generally remained <1 μM-N year-round (Fig. 3a–c). The highest seasonal variability was found in PO4 3−, which also displayed considerable station-to-station variability (Fig. 3a–c). In general, both N and P annually and regionally averaged concentrations increased throughout the bay over time, but the trends differed by nutrient form and bay segment. Averaged TN increased in all bay segments except segment III (Fig. 4). These increases were ~a factor of 2 in most regions. While no significant trends were observed for TN for segment III, this region had the highest overall concentrations of TN relative to other regions on the bays. Averaged TP increased with time only in segments IV, V, and VI, while trends with time for the other segments were not significant (Fig. 4). Significant increases in annually averaged NH4 + concentrations, in some cases more than an order of magnitude, were observed in all bay segments (Fig. 5). For NO3 −, significant increases were only observed for segment V, and even then, the concentrations remained <1 μM on an annual basis (Fig. 5). For PO4 3−, in addition to the regions where TP increased, there were also positive, significant increases in segments II and III with time, with some of these increases being as much as a factor of ~3 (Fig. 6). Trends in annual Si(OH)4 concentrations were variable (Fig. 6), and a significant increase was only observed in segment IV. While both mean N and P tended to increase with time in most bay segments, the change in proportion of N to P (N/P ratios) was not nearly as large, that is, the increases in both nutrients were proportional. Significant increases in TN/TP were only noted with time for segments I and VII and in DIN/DIP in segment VII also; all other segments showed no significant change with time in TN/TP or DIN/DIP (Fig. 7). There were no instances in which the N/P ratio (in any form) decreased with time; thus, there were no regions where the increase in P exceeded that of N over the time course, although within the time course, there were short periods for some regions where such patterns were observed. The CUSUM calculations for inorganic nutrients illustrate clearly the overall trends of nutrient values falling below the mean in the first part of the time series and values falling above the mean in the second part of the time series (Fig. 8). CUSUM, however, provides further power to differentiate inflection periods that differed with nutrient form and with bay segment. For NO3 −, the first years of the CUSUM charts for all segments show considerable variability (Fig. 8a). After this period of variability, values for all bay segments show a general decline in CUSUM NO3 − up to 2003 (i.e., values below the long-term mean), when a reversal in trend was noted. It is important to recall, however, that overall concentrations of NO3 − were low throughout the time series, so small changes may accentuate trends. For NH4 +, all segments showed a clear declining CUSUM trend until 2001 (i.e., concentrations below the long-term mean), a short uptick ~2001, followed by another decline up to 2003, and then a period through 2008 during which CUSUM values trended upwards (i.e., concentrations above the long-term mean; Fig. 8b). In contrast to NO3 −, the CUSUM values for NH4 + for all bay segments were generally consistent in trends and values. Trends in CUSUM PO4 3− generally declined until about 2001 (i.e., concentrations below the long-term mean), although with variable slopes for different bay segments, then increased abruptly and either continued to increase or remained roughly constant (Fig. 8c). For bay segment I, the initial trend was significantly more pronounced. Trends in Si(OH)4 CUSUMs also displayed a downward trend until ~2001, then an upward trend until roughly 2003, and then near constant values (Fig. 8d). Seasonality was more apparent in CUSUMs of Si(OH)4 than in any other nutrient. Half of all Chl a values of the entire data set were <5 μg L−1 (Fig. 9a). However, when higher Chl a, >5 μg L−1, did develop, it was generally a summer phenomenon (Fig. 9b). More than 75 % of the incidences of Chl a >5 μg L−1 occurred in the months of June through September; a spring bloom accumulation of Chl a is generally not observed in these bays. This trend is reflected in the accessory pigment trends as well (Fig. 3d–i). Changes with time in Chl a were highly variable by bay segment, but, in spite of the increases in TN and TP throughout much of the Bay, significant linear trend increases in Chl a were only observed in segments IV, VI, and VII (Fig. 10). The CUSUM trends for Chl a for all bay segments show similar trends: values were less than the long-term mean until early 2003, after which values were above the long-term mean (Fig. 11a). The inflection points in the CUSUM Chl a trends approximate the period when SAV began to decline (Fig. 11b). Estimates of changes in coverage of SAV are only available for some of the bay segments, but all show an increase with time until the early 2000s, then a decline. Survey data for SAV are not available for 2005 due to logistic problems, but overall, 2005 can be considered a year of substantial SAV loss. There have also been pronounced changes in the phytoplankton composition over time as suggested by the change in phytoplankton pigment composition. Data on changes over time in accessory pigments are available only for the latter years for which Chl a data are available, but such data suggest that the changes in phytoplankton were variable by region (Figs. 12 and 13). Zeaxanthin, indicative of cyanobacteria, increased significantly with time for segments II and VII, while the other segments showed no significant linear trend (Fig. 12). There were increasing trends in annual fucoxanthin concentrations, indicative of diatoms, also for segments II and VII (Fig. 13). Changes in peridinin, indicative of peridinin-containing dinoflagellates, were highly variable both within and between sites; there was a decline over time in segment III (Fig. 13). Interestingly, there were no significant increases or decreases in but-fuco (indicative of brown tide, A. anophagefferens) in any bay segment (Fig. 12). The time series encompassed by these data reflect variably wet and dry periods (Fig. 14). When transformed into z-score CUSUM trends, the oscillation between dry years (1995–1996), variably wet (through ~mid-1998), then drier (through ~2002), and then wet again through ~2007 is readily apparent (Fig. 14). Superimposed on this general trend were additional short-term fluctuations between wet and dry periods. The CUSUM time course for freshwater discharge was herein deconstructed into 11 time periods representing wet and dry periods lasting more than a season (Fig. 14). [Short-term oscillations of wet and dry <1 year were disregarded for this analysis because seasonal trends could override climate variability trends]. For NH4 +, average concentrations for the wet periods later in the time course were higher than those earlier in the time course for wet periods, but during dry periods, the increase in mean concentrations in periods 9 and 11 compared to those earlier in the time course is even more striking (Fig. 15a, b). Concentrations of NH4 + averaged 2.03 μM-N during the wet period early in the time course and more than doubled to 4.67 μM-N later in the time course; however, the same comparison during the dry periods shows a greater than four-fold change, from 2.07 μM-N in the early periods to 8.26 μM-N in later periods, on average. For NO3 −, average concentrations of the latter wet periods were lower than the wet period earlier in the time course, an insignificant change from 1.75 to 1.29 μM-N on average, while for dry periods, average concentrations increased from 0.47 μM-N early in the time course to 0.81 μM-N later (Fig. 15c, d). For NO3 −, because the overall concentrations were so much lower than those of NH4 +, the region-to-region variability appears greater. For PO4 3−, a near doubling in average concentrations in wet periods later in the course compared to early in the time course can be seen (0.34 μM-P early periods versus 0.65 μM-P later periods), but no substantial differences were apparent when dry periods were compared (0.58 μM-P early periods versus 0.77 μM-P later periods; Fig. 15e, f). The analysis herein has taken a large-scale perspective of the regional changes in this ecosystem. Such an approach helps to identify large-scale patterns of change, yet may fail to reveal significant trends that occur at more local scales. Different clustering of regions may have resulted in somewhat different localized trends. Indeed, individual trends for several of the original 18 sites (not shown) are not as strong when aggregated within the regions. Furthermore, this analysis has focused on annual average trends, thus blurring any differences in trends that have occurred seasonally. Further analysis of local scale trends will be important as these results are applied in the development of nutrient loads and criteria for nutrient reduction strategies. A recent, more detailed analyses of the Newport Bay (subregion of region III) and Johnson Bay (subregion of region IV) have been provided by Beckert et al. (2011) and Fertig et al. (2013). The large-scale, long-term trends of nutrients and phytoplankton abundance and community composition in this analysis reveal several striking patterns and relationships. Most apparent in these results is the seemingly abrupt change in the systems’ ecology in the early 2000s, with increasing Chl a accumulation in some bay segments, increasing concentrations of NH4 + in all bay segments, loss of SAV, and changes in phytoplankton community composition. Although the raw data were herein analyzed using linear trends, consistent inflection points were shown in the CUSUM analysis. Previous analyses of this data set, in which trends through 2003 were examined (Wazniak et al. 2007), also suggested that any improvements in water quality that had been established in the 1990s were rapidly being reversed and that water quality trends were declining by early 2000. Such abrupt changes are analogous to those often described for freshwater systems, in which productive lakes can undergo a change from one stable state to another in seemingly rapid fashion (sensu Scheffer et al. 1993, 2003). Stable state theory states that a system will develop a stable state condition, i.e., homeostasis will prevail, until an environmental change or disturbance occurs. This change alters the positive reinforcing feedbacks of homeostasis, and the system is shifted to a new stable state: hysteresis overcomes homeostasis (Scheffer et al. 1993; Scheffer and Carpenter 2003). Furthermore, communities may not return to their original state when the disturbance is removed. Stable state theory is being applied in systems where there are efforts to restore macrophyte dominance in systems that have become dominated by phytoplankton as a consequence of increased eutrophication (e.g., Bachmann et al. 1999; Tátrai et al. 2009; Poor 2010). In this case, while anthropogenic stresses were increasing over the duration of the time series, the bay ecology appeared to reach a tipping point in the early 2000s. This paper extends the analyses of Wazniak et al. (2007) and Glibert et al. (2007) in which the declining water quality trends of these bays were first highlighted. We highlight several overarching trends, then potential physical and biogeochemical mechanisms and drivers are then explored. The characterization of water quality useful for management is a contentious issue, as not all parameters are of equal value in characterizing water quality, nor do they necessarily trend equally. Here, several overarching trends are highlighted that should be of value to managers charged with characterizing eutrophic condition and effectiveness of nutrient strategies. First, nutrient concentrations have increased through the bay in the time period of this analysis, but not all forms of nutrient have increased similarly. For TN (Fig. 4), values have increased more than approximately twofold and these trends have been in near linear fashion in most regions of the bay since the beginning of the time series explored here, suggesting sustained anthropogenic pressure. For NH4 +, the increase in many parts of the bay is even greater, reaching an order of magnitude in just over a decade. Trends in NH4 + (Fig. 5), while significant for all bay segments when calculated using a linear model, actually show that the increase only began in a substantive and sustained way in 2003, as reflected in the CUSUM trends (Fig. 8). In contrast, concentrations of NO3 −, with one regional exception, have remained roughly constant, and very low, over time. Increases in most bay regions in TP have been similar in proportion to those of TN in most of the bay, leading to little change in N/P ratios, when calculated using either TP or PO4 3− values (Fig. 7). The primary exception to this generalization is the lower bay segment VII where ratios of N/P increased significantly. Second, the trends were bay-wide. While there were regional differences in the extent to which different nutrients or their ratios changed with time, the directionality of all nutrients in all bay segments was similar even when linear trends did not support significance in these changes. For all inorganic nutrients, the overall shapes of the CUSUM curves (Fig. 8) for each region suggested general consistency in trends. Of particular concern is the apparent increasing degradation of the regions in the southern part of Chincoteague Bay, regions that had previously been characterized as having “good” to “excellent” water quality based on the multiparameter eutrophication index of Wazniak et al. (2007). The more northern regions, including Newport Bay, have long had degraded water quality (Wazniak et al. 2007; Beckert et al. 2011). Within these regions, particularly, are several sites where more significant increasing trends are revealed from individual site analysis not shown here. Third, these results are consistent with the emerging understanding that nutrient dynamics in coastal lagoons differ from those of classic river-dominated estuaries. Of particular concern for coastal lagoons is increasing concentrations of chemically reduced (NH4 + and DON), compared to oxidized N (NO3 − or NO2 −). All bay segments had significant increases in annually averaged NH4 + concentrations, but only one region had an increase in average concentrations of NO3 − (Fig. 5). In fact, the trend in NH4 + > NO3 − was enhanced with time as TN loading increased, suggestive that either the TN loading was not in the form of NO3 −, or that there was a significant biogeochemical processing of NO3 −, leading to NH4 +, that may have acted synergistically with anthropogenic loading, as discussed in more detail below. Whereas concentrations of NO3 − in many riverine systems can exceed many tens of μM (e.g., Chesapeake Bay, Kemp et al. 2005; Neuse River Estuary, Christian et al. 1991 and Burkholder et al. 2006), lagoonal systems—as illustrated here and elsewhere—tend not to have elevated NO3 − concentrations (Boyer et al. 1999; Burkholder et al. 2006; Glibert et al. 2007, 2010). Indeed, 80 % of all values of NO3 − were <1 μM-N in this time series. In addition to NH4 +, organic forms of N and P tend to dominate the nutrient pool in lagoons compared to their respective inorganic nutrient forms (Boyer et al. 1999, 2006; Glibert et al. 2007). The increasing trends of DON and their effects have previously been described (Glibert et al. 2007). Fourth, these data suggest that the increasing trend in brown tide that was so prevalent during the early 2000s appears to have been dampened, at least when the data are viewed from the regional perspective. While brown tide (as detected using the pigment but-fuco) is present and abundant in many segments of the bay, the intensity of the blooms has not been increasing, except in the southernmost region of the bay when viewed from the regional scale. Rather, cyanobacteria, as indicated by the change in zeaxanthin (Fig. 12), as well as dinoflagellates, indicated by the change in peridinin, and/or diatoms, indicted by the change in fucoxanthin (Fig. 13) appear to be increasing in some segments of the bay, especially segments II and VII. Microscopic enumeration (not shown) confirms that the dominant cyanobacteria are the picoplankton Synechococcus. The trends shown herein are also consistent with other coastal lagoons in having the highest Chl a accumulation in the summer months, rather than in the spring (Glibert et al. 2010). From a management perspective, these trends underscore the importance of characterizing different forms of nutrient and of understanding the compositional changes in Chl a. For example, with many monitoring programs moving toward cost-saving measures by reducing the numbers of parameters monitored or application of in situ nutrient detection of a single form of N, a program that relied solely on NO3 − monitoring, for example, would have been totally ineffective in elucidating the trends reported herein. Furthermore, understanding changes in the composition comprising Chl a are helpful in understanding absolute Chl a values and their changes over time. Recognizing that the dominant phytoplankton in this system are picoplankton, either brown tide or cyanobacteria, helps to understand potential disruption to the food web. EDABs do disrupt food webs. These fundamental differences in blooms between lagoons and river-dominated estuaries have important implications for nutrient management as well as for the development of estuarine nutrient criteria for these systems. Changes in PO4 3− and in NH4 + appeared to have occurred relatively abruptly, or in step function, around the years 2001 to 2003, although evidence of some changes is apparent in earlier years as well (Wazniak et al. 2007). In general, poultry operations and agricultural practices have not changed significantly over the past decade, except that there has been increasing pressure for application of best management practices, and thus, it is not likely that these land uses alone would have led to such abrupt changes, although these operations are likely major contributors to overall nutrient loads (Beckert et al. 2011; Fertig et al. 2013). While TN concentrations have been found to be very high in tributary streams adjacent to poultry farms (~50–200 μM-N), there has been no appreciable change in the total numbers of poultry produced or in the numbers of farms in the past decade (United States Department of Agriculture USDA 2007; Fertig et al. 2013). There has been an increase in the use of urea-based fertilizers, and some of the sites receiving runoff from poultry farms have previously been also shown to have some of the highest regional concentrations of urea and/or NH4 + (Glibert et al. 2005a, 2007). Measurements of atmospheric deposition since 2000, based on the National Atmospheric Deposition program, suggest that NO3 − is decreasing and NH4 + from deposition is stable for the Coastal Bays (NADP data http://nadp.sws.uiuc.edu/sites/ntn/NTNtrends.html?siteID=MD18). That septic N loading is increasing is well established from the increasing population in the watershed and the general trend in increasing residential population may help to explain some of the increasing TN and TP (Fertig et al. 2013). There has been at least a doubling of the population since 1980 (Wazniak et al. 2007), and much, if not most, of this residential increase has not been sewered (Souza et al. 1993). Rigorously identifying and apportioning the sources of increasing nutrients to the Coastal Bays is going to remain a challenge for years to come. Anthropogenic inputs likely explain the increasing TN and TP (Fertig et al. 2013), but alone do not appear to explain the changes in nutrient forms nor the timing of those changes. An understanding of not only the total quantity of nutrient changes, but the quality of those changes, and why they may be occurring, is key to understanding how nutrient loads alter ecosystem function. The relatively abrupt change in nutrient concentrations, and therefore Chl a accumulations, could be due to several possibilities, as well as to positive reinforcing feedbacks among them. Here, we suggest that the effects of a combination of steadily increasing anthropogenic nutrient increases from development, superimposed on nutrient loads from farming and animal operations, were accelerated by changes in freshwater flow and associated biogeochemical responses. Freshwater flow was above the long-term mean from ~1996 to 1998, then there was a long-term drier period until late 2002, another long-term wet period until 2007, and another reversal (Fig. 14). Regardless of whether anthropogenic nutrients were being delivered to the bays from surface runoff or from groundwater input, the extent of freshwater flow will affect nutrient loads. It has been estimated that low freshwater flow, as seen for example in the early 2000s, can result in increased terrestrial storage of nutrients, but these nutrients are subsequently transported to the bay when freshwater flow increases (e.g., Acker et al. 2005). The fate of such nutrient input from strong freshwater flows depends on many factors, and the long residence time of the Coastal Bays suggests that there is substantial biogeochemical processing of such nutrient. While the Coastal Bays do not receive significant riverine flows, they are not isolated from either direct or indirect effects of changes in flow. Superimposed on the comparatively long dry period from 1998 to 2002 were a few episodic weather events, including hurricanes. Hurricanes have been associated with both algal blooms events and longer term changes in many other estuaries (Mallin and Corbett 2006; Paerl et al. 2006; Burkholder et al. 2006; Briceño and Boyer 2010). In June 2001, Tropical Storm Allison passed directly through these bays (http://www.nhc.noaa.gov/2001allison.html), bringing heavy rains and winds. The timing of the change in PO4 3− appeared to correspond with the passage of this storm as well as to other large unnamed weather events in fall 2001 and early 2002 which resulted in high water levels, overwash, and surface runoff especially in the northern segments. The change in PO4 3− following these storms may have resulted from freshwater flow directly, but there may also have been a significant release of PO4 3− from benthic sources. Benthic resuspension events may be a significant source of nutrients to the water column in these shallow systems (Lawrence et al. 2004). Coincident pulses in PO4 3− with rain events have also been observed using continuous monitoring systems in the adjacent tributaries of Chesapeake Bay (Glibert et al. 2005b, 2008). Furthermore, it has been shown that different storm events can yield very different responses in nutrients even with the same storm intensity, depending on the frequency and timing of prior rain events and nutrient build-up in adjacent lands and sediments. Once P became elevated in the system, it tended to stay elevated on a long-term basis, even with seasonal variation. The passage of hurricanes similarly corresponded with changes in TP and PO4 3− in Florida Bay in 2005 (Briceño and Boyer 2010) and associated ecological changes in that system, including sustained picoplankton blooms (Glibert et al. 2009). The change in NH4 + appeared to be offset in time relative to that of PO4 3−. A modest increase in NH4 + was observed coincident with the increase in PO4 3− in 2001 (Figs. 5 and 8), but the major change in NH4 + came a few years later, in 2003. This change appeared to be related to the long-term change from a dry to a wet period, but may have also been related to Tropical Storm Isabel that passed in September 2003. Resuspension of sediment due to wind may have contributed to elevated NH4 + at this time. Yet, as was the case with PO4 3−, once NH4 + began to increase in the system, it remained elevated, on average, or increasing throughout all seasons and from year to year, further suggestive of biological and biogeochemical processing. Nutrients that had accumulated in the system were remobilized by the change in long-term dry to long-term wet conditions. The biogeochemical processes associated with this accelerated NH4 + accumulation are discussed in more detail below. First, however, potential changes in groundwater nutrient loads are considered. Without major riverine sources of freshwater to these bays, nutrients largely enter the bays via groundwater, the delivery of which will vary with the strength of freshwater flow. Surface runoff is generally considered to be an insignificant nutrient source due to highly permeable sands and relatively low proportion of impermeable surfaces (Dillow and Greene 1999; Dillow et al. 2002), although storm events are exception to this generality. The groundwater table, calculated for the more southern regions of the coastal bays, is shallow, only a few meters below sea level (Galavotti 2004). During the wet period early in the time course, average concentrations of NO3 − in the water column were higher than they were during the latter wet periods (Fig. 15c), although still comparatively low. However, the decrease in average concentrations during the latter wet periods for NO3 − is more than offset by increases in NH4 + during these wet periods (Fig. 15a). After 2002, higher average NH4 + concentrations were apparent during wet years, but the change was even more dramatic for the dry periods (Fig. 15b). If the change in long-term dry to long-term wet results in an increase in groundwater input, why would the increases in NH4 + exceed those of NO3 −? There may have been a change in nutrient composition of the groundwater. It is possible, perhaps, that management practices put into place years prior resulted in less NO3 − in groundwater overall. A more likely possibility is a change in sediment biogeochemistry driven by increasing loads of N. Several changes in sediment biogeochemistry are hypothesized to have occurred in response to increased nutrient loads and freshwater flow; such changes would act synergistically with new loads to accelerate water quality decline. First, it is suggested that increased nutrient loads were directly or indirectly related to loss of SAV that, in turn, resulted in increased nutrient regeneration at the sediment–water interface (Fig. 11). The massive die-offs in SAV that were observed in 2005 were most likely a result of multiple stresses. Declines in transparency due to Chl a accumulations could have contributed to their declines in growth due to light limitation. Summer 2005 also had exceptionally warm temperatures (E. Koch, personal communication). As NH4 + accumulated, it too may have been deleterious to growth of these plants. In fact, previous studies have shown that water column NH4 + levels of 25 μM can cause seagrass death (Zimmerman et al. 1987; van Katwijk et al. 1997; Brun et al. 2002), and toxic effects can be prolonged in waters with poor residence times (Touchette and Burkholder 2001). In early summer 2005, at least in some regions, mean monthly concentrations exceeded 10 μM NH4 +, which suggests that there may have been days with considerably higher concentrations, even if such extreme levels were not prolonged. SAV die-offs would also contribute to organic matter that may have been regenerated in later months; some of the highest individual monthly measurements of NH4 + were observed in January 2006 (segment IV, 20.8 μM) and July 2006 (segment III, 38.6 μM). Since 2005, SAV have returned, but remain at levels less than those observed in 2002. This trend is, in fact, in contrast with that of the Virginia coastal bays where SAV have been increasing due to natural as well as anthropogenic actions to foster its proliferation (Orth et al. 2006, 2010; Orth and McGlathery 2012). Another potential contributor to increasing NH4 + is the adjacent degrading marshes. In many reaches of the Coastal Bays, marshes are eroding, leading to more sulfidic conditions (J. Cornwell, personal communication), which would, in turn, further support reducing environments leading to increasing NH4 +. It is also suggested that microbially mediated dissimilatory NO3 − reduction to NH4 + (DNRA), a process by which NO3 − is converted to NH4 + in the presence of organic matter under reducing conditions, may have become a more important process over time. DNRA is bioenergetically analogous to denitrification, being used for respiratory energy, except that the end product is NH4 + instead of N2 gas. The DNRA process is stimulated in sediments with high organic matter and low oxygen concentrations (Tiedje 1988; An and Gardner 2002; Burgin and Hamilton 2007), both of which became established in the Coastal Bays with the more frequent development of algal blooms and organic enrichment. For such a process to have become dominant would require that the sediment interface had become a reducing environment, and thus, the NO3 −, rather than effluxing to the water and increasing its concentration therein, would result in the reduction of NO3 − to NH4 + and an increase in its concentration. Thus, groundwater fluxes of NO3 − have likely increased, but concentrations have not accumulated because of rapid biogeochemical processing. The potential importance of DNRA in Coastal Bays is large, although it has not been measured in these systems and should be pursued in future studies. In a wide range of marine and estuarine sediments, DNRA has been found to account for up to 70–100 % of NO3 − removal (Burgin and Hamilton 2007). If the source of the increasing NH4 + is DNRA, then the ultimate source of the N is NO3 − in groundwater, which represents new N loadings to the system, in addition to regeneration of decomposing organic matter from recent algal deposition and SAV die-backs. While sustained hypoxia or anoxia is not common in these coastal lagoons due to their shallow and well-mixed nature, localized hypoxia does occur, especially on diel bases, especially during the period of algal blooms in summer (Wazniak et al. 2007, www.eyesonthebay.net). Localized hypoxia would not only provide an environmental condition conducive for DNRA but may also be inhibiting removal of NO3 − by denitrification (Childs et al. 2002; Burgin and Hamilton 2007). Lagoonal systems diverge along the classic lines delineated for herbivorous food web versus microbial food web systems (e.g., Legendre and Rassoulzadegan 1995). Where the algal community is dominated by cyanobacteria, or other picoplankton, the system generally sustains a proportionately greater flow through the microbial loop (Azam et al. 1983; Legendre and LeFevre 1995; Legendre and Rassoulzadegan 1995). The dominance of regenerated forms of N, and high organic loads, derived from both microzooplankton grazing and/or benthic fluxes, favors small-sized phytoplankton with high growth rates (Glibert 1998). Although the Coastal Bays have had significant picoplankton assemblages for many years, the change in phytoplankton composition from the previously observed trend of increasing brown tide blooms to mixed communities with more cyanobacteria in some regions is also interesting. With nutrient change, the phytoplankton community of these bays underwent composition changes with time. Brown tide had previously been shown to increase from the early 1990s to the early 2000s (Trice et al. 2004; Glibert et al. 2007). Over the period of 1999–2004 inclusive, summer brown tide bloom strength increased with increasing N, primarily as DON (Glibert et al. 2007). In recent years, brown tide has not continued to increase, but it has also not substantially decreased either. Elevated NH4 + has been found to be inhibitory of rapid brown tide growth in the laboratory (P. Glibert, unpublished data). Inhibitory effects of NH4 + on phytoplankton metabolism and growth have been observed in a wide range of systems, at concentrations as low as 1 μM, but such effects are manifested differently by different phytoplankton groups and at different concentration thresholds (e.g., Dortch 1980; Yoshima and Sharp 2006; Dugdale et al. 2007; Domingues et al. 2011). When the NH4 + concentrations in the water began to be sustained at significantly higher concentrations than in prior years, beginning ~2003, cyanobacterial picoplankton increased relative to brown tide. It should again be underscored that in contrast to the Trice et al. (2004) or Glibert et al. (2007) analyses, the data presented here are more regionally encompassing, and thus, it is likely that localized areas may have had increases (or decreases) that were not captured in the regional trends. As previously reviewed (Glibert et al. 2010), blooms in lagoons are “poised on the edge” in several ways. First, they compete with other primary producers in the system, mainly benthic microphytobenthos, macroalgae, and SAV. Also, due to their small size, they do not have the physiology to store large pools of nutrients internally, so nutrient limitation is a continual challenge (e.g., Sunda et al. 2006). Blooms in lagoons may be responsible for significant ecosystem disruption, even at Chl a levels that would not normally be taken as “bloom” conditions in a riverine-dominated estuarine system (Glibert et al. 2010). The average inorganic nutrient ratios for these bays, consistently below the Redfield proportion, would suggest some degree of N limitation, but this appears to be countered by the elevated TN/TP ratios, suggestive of a significant pool of DON. Those organisms that can thrive on reduced N do well under such conditions. Brown tide did well in the earlier decade because this reduced N was largely in the form of DON, but has apparently been succeeded in some regions by pico-cyanobacteria that not only do disproportionately well under reduced N conditions, but can also sustain elevated NH4 + concentrations. Regardless, in order for blooms of brown tide or picoplankton cyanobacteria to be sustained, nutrients must be supplied or regenerated on a continual basis, and it appears that this is indeed the case, and biogeochemical processes such as sediment organic matter remineralization and DNRA may be important in this regard, driven by increasing fluxes of groundwater NO3 − that compound other anthropogenic nutrient loads. As EDAB species, these bloom-formers are often unpalatable or toxic and thereby reduce grazing, and the positive feedbacks of reduced grazing and/or bottom shading further contribute to the availability of nutrients for these blooms (Sunda et al. 2006). In summary, there have been significant changes in the nutrient and plankton composition of the Coastal Bays over the past decade and half (Fig. 16). There appear to have been one or more episodic events that resulted in altered nutrient loads and sediment processing, but the major change occurred in 2001–2003 with a shift from a long-term dry to a long-term wet period. These changes, while apparent in the long-term data, were readily discernable using CUSUM analysis. It appears that increased nutrient anthropogenic loads, in conjunction with altered biogeochemical processes in this highly retentive system, have led to a maintenance condition of significantly higher ambient concentrations of both N and P than in prior decades. Virtually, all of the N in the water column is now in the chemically reduced form, NH4 + or DON, resulting in phytoplankton community shifts to those species that can do well under such conditions. The management problems of rapidly changing ecosystems such as this are very large. With long residence times, nutrients tend to stay in the system. Negative reinforcing biogeochemical feedbacks appear to have contributed to the deterioration of water quality and have accelerated the effects of anthropogenic nutrient loads. Nutrient reduction strategies for a region where nutrients are dominated by nonpoint sources including groundwater inputs are far more difficult than for regions where discrete point sources are readily identifiable. Further analysis of localized nutrient trends will aid in identifying local inputs and drivers of change. Further efforts to couple land use changes with nutrient loading patterns are needed. The responsiveness of the primary producers to change gives hope that with directed efforts a healthy system can again be established, even if such change may take many years. As noted by Kemp et al. (2005), in the analysis of eutrophication of the Chesapeake Bay, just as reinforcing feedbacks may accelerate ecosystem degradation and eutrophication, positive biogeochemical reinforcing feedbacks can also help to reinforce restoration once water quality improvements begin to take hold. The Maryland Coastal Bays Program has numerous nutrient management policies in place. With increased intensity for dual nutrient reduction, long-term recovery of this system should be possible, or at least further degradation should be able to be slowed. This work was supported by the Maryland Coastal Bays Program. PMG was also supported by Maryland Sea Grant and the State and Federal Contractors Water Agency. The assistance of the Horn Point Analytical Services Laboratory is greatly appreciated. We thank C. Wazniak, W. Dennison, J. Cornwell, and C. McCollough for helpful discussions. This is contribution number 4633 from the University of Maryland Center for Environmental Sciences. United States Department of Agriculture (USDA). 2007. Census of agriculture. http://www.agcensus.usda.gov/Publications/2007/index.php. Accessed 22 Aug 2012.